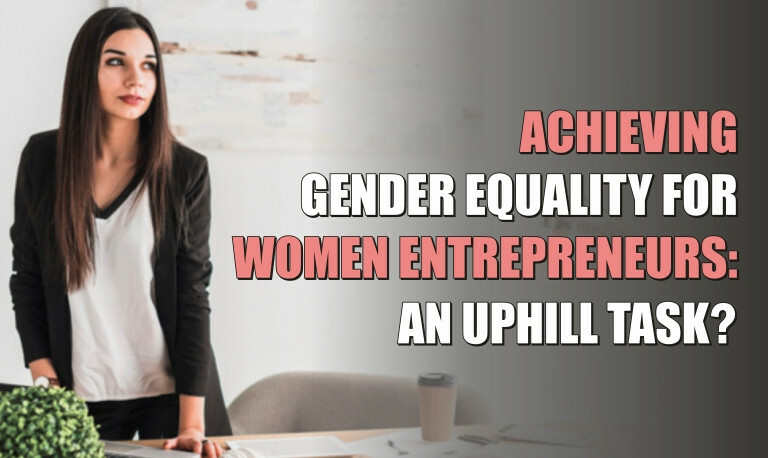 SheAtWork / Blogs / Achieving gender equality for women entrepreneurs: an uphill task? Today, it can be seen that businesses are flourishing indeed. But, an important point is that with increasing number of businesses being steered by women, entrepreneurship is still dominated by males. In fact, this is the reason why gender gap still persists in entrepreneurship. Why does the gender gap exist in entrepreneurship? There have been policies to promote women’s entrepreneurship, and certainly policies have been directed at uplifting women but still, the reality is that gender bias exists in the environment. The time has come for women to play a more equitable, just and central social role, contributing both to their empowerment and to the economic, social and political development of their countries. Today, it is heartening to note that modern societies are paying heed to this. In India too, recently, the government has launched many schemes for women aimed at their upliftment. Some women empowerment initiatives in India include Beti Bachao Beti Padhao Yojna, which was launched in 2015 from Panipat, Haryana on the occasion of International Day of the Girl Child – to generate awareness and also improve the efficiency of welfare services meant for girl child. Then there was Mahila E-Haat launched – to support women and also ‘Make in India’ launched in 2016, by the Ministry of Women and Child Development. The Mahila E-Haat is an initiative aimed at meeting needs of women entrepreneurs, and provides a unique and direct marketing platform and also leverages technology for supporting women entrepreneurs, SHGs, and NGOs. This has helped a lot! Globally samples of a current trend of change that aims to redress the balance between men and women are campaigns that have popped up like – #MeToo. This will have an impact especially in the workplace, family and in terms of security. Meaning, they implicate equal opportunities and same wages for the same job, a more equitable distribution of family roles, and an efficient prosecution of sexual abuse and gender violence. In Asia and the Pacific, there has been some progress towards greater equality. With this objective in mind, the obstacles women face to find decent work or set up a business in Asia and the Pacific deserve special attention. Female labour force participation has declined and most working women are trapped in informal employment, characterized by low wages and dangerous working conditions. We know that setting up a business is a key means for women to empower themselves and overcome poverty. Some barriers include a lack of access to education or training, market information and finance. But, the good news is that despite these constraints, the number of women entrepreneurs has been increasing in the Asia-Pacific region. Women entrepreneurs in ASEAN countries have been particularly successful. The proportion of firms with women owners have gone up in the Philippines, Thailand and Vietnam. This has been achieved through gender responsive budgeting, programmes to support SMEs, and strong civil society advocacy – to ensure women’s entrepreneurship is prioritized in national policy making. It is significant that at the United Nations Economic and Social Commission for Asia and the Pacific (ESCAP), have acknowledged that they want to work with countries across policy areas – to develop a gender responsive entrepreneurial ecosystem. One critical area they identified is – the need to improve women’s access to diverse sources of financing. Financial inclusion of women is a must! There are certain factors that can be adopted to quicken the pace of change. Combined with measures to improve financial literacy, these solutions (like entrepreneurship bonds, impact investment funds and gender responsive financial solutions) should improve access to finance and support greater growth. Making life easier for women entrepreneurs is to support women’s empowerment. It can help eliminate gender inequality, protect a fundamental human right and bring considerable economic benefits. So, here’s raising a hope that the environment will be moving towards becoming more entrepreneurial, to achieve equality, thus giving women the support and opportunities they deserve….